I left the Sofitel Sukhumvit a little after 2pm and I arrived at the airport quite early at about 3, plenty of time for the 5.15pm departure. Check-in was completed quickly and I was handed an express departures card along with my boarding pass for the flight and for the onwards connecting flight to Cairns. The express pass came in very handy as the passport control queues were rather long, mostly packed with holiday makers heading home from a Christmas break in Thailand. I decided to make use of the Qantas-Emirates partnership by going to the Emirates lounge instead of the Qantas one. I was welcomed into the lounge but told that no departure announcements would be made, which was fine by me. I was glad I had gone there as it was very relaxing with only about 4 other guests at the time. The food and beverage offering in the Emirates lounge is very good with a great selection of wines, a proper French Champagne and plenty of food options. I made use of the showers whilst I was there to freshen up and found the facilities clean and well appointed. As it got closer to the departure time I decided to head over to see what the Qantas lounge had to offer. Once upon a time there was a First Class lounge here that was shared with British Airways but since Qantas no longer operates a Joint Service Agreement with BA the lounge's have gone their separate ways. At the time of the Qantas departure the BA First lounge is closed, meaning all guests are accommodated in the Qantas Business Class Lounge. There was a reasonably good selection of food offerings but the drink offerings were fare superior in the Emirates Lounge. Plus the ambiance was nicer in the EK lounge since there was so few people, compared to a big crowd in the Qantas Lounge. It is fortunate that more people don't seem to realise that if they have gold or platinum status with Qantas they can actually use the Emirates lounge. Feeling restless, I decided to head to the gate early to have a look at the aircraft before it was time to board. It was departing from gate G2 which is quite close to the lounge. As I headed down the concourse I saw that familiar flying kangaroo on the tail from some distance away. As an Australian it always makes me feel like I'm almost home when I see it, and I really hope Qantas comes through it's current troubles and emerges as a strong carrier in the future (hopefully under a new leader). I want to be able to see that Kangaroo at airports around the world for a long time to come! Today's flight was being operated by VH-OJI, a rather senior member of the fleet at just over 23 years old! She has been flying the globe for Qantas for the whole time. Qantas 24 to Sydney - boarding soon! There was the usual manual inspection of the hand luggage at the top of the gate (something they seem to insist on doing for Australia bound flights). Once that was done it was down the ramp to get my boarding pass scanned. Looking over the gate agents shoulder was an Australian government official, I've noticed they seem to be regularly at the departure gates of Australia bound flights just checking things out. Eventually it was time to board the old bird and I was at the front of the line, eager to settle in with a glass of champagne! There is something very special about the nose of a Boeing 747 parked up against an airport terminal! This aircraft is fitted with Business, Premium Economy and Economy with 371 seats in total. Business class is in the upper deck and in the nose section. As this is normally a 2 class route there was no premium economy sold on this flight so a lucky few passengers who booked economy and had elite status got to sit in the premium economy seats at no extra charge! The nose section is a great exclusive cabin normally used for First Class and I had especially chosen to sit there to enjoy the 'nose seating' atmosphere. My seat today was 1K. This is one of the older Qantas skybeds so it is not a fully flat seat, instead it is an angled lie flat. This is quite similar to what Thai Airways offers on its Boeing 747 on the same route, so whilst it is old, it is still relatively competitive when you compare it to Thai. There is audio video on demand with a good selection but the screen is rather tiny. Whilst everyone was boarding a glass of champagne was offered along with an amenity kit. The kit was actual an old first class kit as apparently they had run out of business class ones. The flight attendant then advised us that there was no pyjamas available, NONE AT ALL. I was pretty annoyed about this as I had worn tight jeans and a button up shirt and had anticipated getting changed into the PJ's for sleeping. Apparently the crew for the inbound flight from Sydney had handed them out despite it being a daylight flight. There was no stock in Bangkok so we had to go without. It meant an uncomfortable flight for me and I lodged a complaint with customer service upon my arrival. Had I known that would happen I would have either dressed differently or brought another pair of pyjamas in my carry on. Sorry the picture is not very clear. I placed my order and then never heard from a flight attendant again for about 1 hour 30 minutes. By that stage I would have hoped to be almost finished my meal but instead we only just began 2 hours into the flight. This is completely unacceptable on an overnight service where the meal should be completed quickly to allow people to maximise their rest. I've noticed Qantas crews take a huge amount of time to get the meals out compared to Thai and other carriers. It is something that needs to be improved on. The presentation is something Qantas does get right though. They do not serve the meal on a tray like Thai, instead everything is placed individually on the table. My pumpkin soup was very nice. I had a glass of white wine to go with it. It comes with a side plate containing a basic salad and some bread. As you can see I had the chicken schnitzel sandwich with swiss cheese and coleslaw for my main. After having asian food for the past few days it was nice to be able to order something as simple as a schnitzel sandwich, it seems to feature on most Qantas business class flights to and from Asia. This one was great, so far so good on the food, and my wine had been regularly topped up too which was an improvement from earlier. The final course was a Thai dessert of black sticky rice with coconut and mango. It was delicious and I could easily have finished a second serving. Tea and coffee was on offer and I ordered a peppermint tea and it also came with a small chocolate to finish. Overall a decent meal but by this stage it was over 3 hours into an 8.5 hour flight which meant about 4 hours of sleep remaining. Not really good enough Qantas, Thai have dinner over and done with in under 2 hours generally. Anyway it was time for a sleep and a flight attendant came around with the seat covers to use as a kind of mattress to even it out. I slept quite comfortably on it with the quite thick and good quality duvet that was available. Here we have some fruit with a spoonful of yoghurt, a small quiche and a warm muffin. It came with a breakfast smoothy which was tasty, however the muffin was dry and the quiche was average. It was all very 'ok' and not what I would expect on a business class 9 hour sector at breakfast. Qantas - PLEASE FIX THIS. You need to offer an option of a full hot breakfast service with all the trimmings to those who want it. Thai and Cathay both manage it - why can't you? It was a terrific way to be welcomed home, with a view like that sitting in the nose of a Qantas jumbo. Welcome back to Australia Aussie flyer! We made our way to the south of the airport and made a few left hand turns before Qantas 24 glided in over Botany Bay for a smooth and on time arrival on Sydney's runway 34L. So ends another journey on the troubled Qantas. I still enjoy flying with them despite some of the problems. The biggest issues I have at the moment on business class flights to Asia is the catering. It is far too slow which reduces the amount of sleep time available to passengers. Also the breakfasts are ridiculous, there should be a full hot breakfast on overnight flights over 8 hours. There should also be consistent soft product offerings, on this flight there was no pyjamas and that just should not happen. Also the flight attendants need to be a little more service oriented, I didn't feel particularly looked after on this flight like I had been flying in First on QF9 the month before. The seats are also needing an update but with the A330 refurbishment coming up later this year it will soon no longer be a problem. Quite a few annoying things there! I totally agree with the meal needing to be served earlier and their breakfast offerings.. not a great Business Class experience! I love the fact that you tried both lounges something I love to as well! yes, definitely room for improvement in business class on the Asia flights! This doesn't look like one of your best Qantas flights. Could it be the fact that a 747 is not normally on this route that contributed to some of the issues? On our recent code shared flight (Emirates/Qantas) we flew Qantas on the return leg from Bkk-Syd. We did not get one hot thing to eat as we were told "the microwave system is malfunctioning". so on a 9 hour 20 minutes flight in J class we had one glass of champagne and a a bottle of water. We then transferred to Qantas domestic to Melbourne. Once again an apology for the malfunctioning microwave system. At that stage I lost it and explained that it was the same excuse used on the previous 9+ hour from Bangkok. 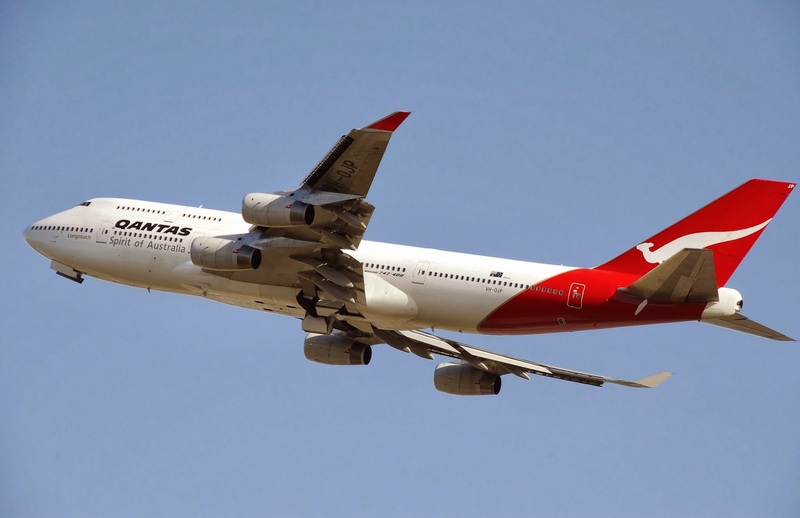 Complaints to Qantas and Emirates with whom we had booked evoked not response whatsever. Oh well, back to SIA and Thai!!!!!! I would continue to take this further. That is quite unacceptable. I've never heard that happening before, it seems rather incredible it could happen on two flights in a row? I have found Qantas quite responsive to feedback/complaints, but it can take 3 weeks or so to get a reply. How long since you contacted them? A good report, indeed. Will be at BKK and will look up QF J lounge as CX is closed for renovation, and the other CX lounge is reported to be a disaster. I too hope QF bucks up and flies onward.